(CelebrityAccess MediaWire) — Clear Channel Entertainment venue Ford Center for the Performing Arts is being renamed the Hilton Theatre, through a naming rights agreement with Hilton Hotels Corporation, which is reportedly for 10 years. 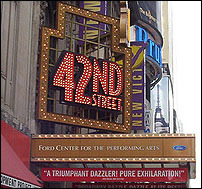 The name change will become effective after the closing of the current production of 42nd Street, scheduled to play through January 2. The first production to play in the newly renamed Hilton Theatre will be Chitty Chitty Bang Bang, which begins previews March 27 and opens April 28. "Broadway is an international destination and tourism is an important part of its economic health," said David Anderson, president, Theatre Management, Clear Channel Entertainment. "We are thrilled with this association in which one of the world's leading symbols of hospitality meets one of its leading centers of art and entertainment." "Building upon the natural link between travel, leisure and the arts, Hilton is extending its legacy in the art of hospitality by sponsoring one of Broadway's finest theatres," said Jeffrey Diskin, SVP, Brand Management and Marketing for Hilton. "Through our relationship with Clear Channel, the Hilton Theatre will celebrate personal performance at its highest level." The Ford Center for the Performing Arts, opened in 1997, and was created by combining two of New York's classic vaudeville houses, the Lyric Theatre (1903) and the Apollo Theatre (originally called the Bryant, 1910). The new venue was designed to adhere to the guidelines for development established by The New 42nd Street to promote the preservation, restoration and reconstruction of the historically significant elements of both the Apollo and Lyric theaters.